The latest wall-mounted RE Inverter from Panasonic is said to provide outstanding energy performance. The manufacturer claims the product exceeds competing products with a SEER ratio of 6.10 A++ and an A+ SCOP of 4.00. The RE works to an outdoor temperature of -15°C in heating mode and -10°C in cooling. The compressor is backed by a five year warranty. The RE system incorporates comfort features throughout the design, including an anti-bacterial filter to eliminate viruses, mould, and particulates from living spaces. Other benefits of the anti-bacterial feature include allergy prevention and an odour removing function. 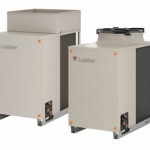 This system operates its high efficiency output with its healthy air capabilities at a sound output of only 22 decibels. With ease of installation in mind, the RE system is compatible with R22 pipings following the recent R22 phase out. The self-diagnoses function, along with maintenance access through the top panel of the outdoor unit makes for easy installation and upkeep.